I FINISHED CARVING THIS FRAME FOR A PAINTING PART OF THE THERMOSTAT EXHIBITION, SPIRITS, GHOSTS AND GREMLINS. THE EXHIBITION OPENS ON THE 1ST OF AUGUST. 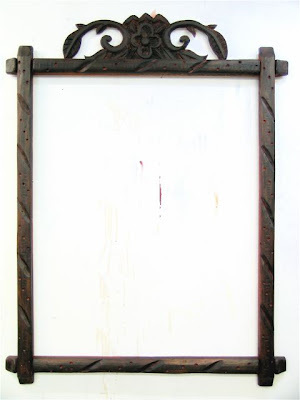 THE FRAME IS A SPANISH-COLONIAL REPLICA, BASED ON AN EXAMPLE FRAMING A CRUCIFIX IN A PRIVATE COLLECTION IN AUCKLAND. THERE ARE MANY VARIATIONS OF THE DIAGONAL SLASH MOTIF AND HOLES WHICH I WILL USE IN FUTURE FRAMES. THE DECORATIVE ELEMENT AT THE TOP, I CARVED OUT OF CUSTOM-WOOD AS I HAVEN'T CARVED FOR A COUPLE OF YEARS AND I'LL NEED TO BUILD UP MY CONFIDENCE TO TACKLE CARVING WOOD WITH GRAIN. I'VE STAINED THE FRAME PRIOR TO ANTIQUING IT, A FEW METHODS I LEARNT WHILE LOOKING AT FORGED RETABLOS AND ARTWORKS OVERSEAS. I DON'T KNOW THE EXACT MEASUREMENTS OF THE FRAME BUT I MADE IT TO HOLD A CANVAS, 1000mm x 800mm.